Dimensions: approximately 82" by 13"
This was a fairly easy knit, as lace goes, but it was made all the more exciting by the use of my own handspun for the yarn. It blocked out beautifully and has a lovely drapiness now. I used size 8/0 clear silver-lined seed beads from Artbeads that I think compliment the shininess of the bamboo very well. 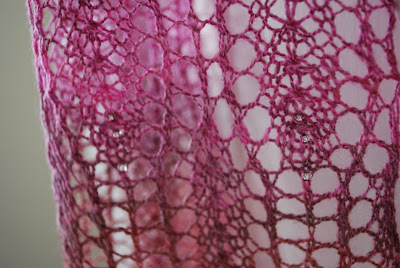 So, a straightforward knit, a good use of my handspun, and a fun way to incorporate some bling. All in all, I'd say it's a winner! 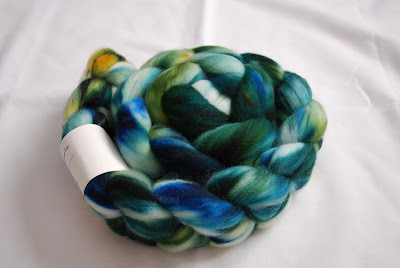 You may remember me mentioning that I've been spinning up some merino/silk fiber and how long it was taking. By my account, it took me nearly a month to spin two bobbins of singles and ply them, which is really a lot of time considering that I've spun some three-ply yarns in much less time. I'd been saving it until I felt I was worthy of it, because the silk content made this bump of fiber just a little more precious than my usual superwash merino. 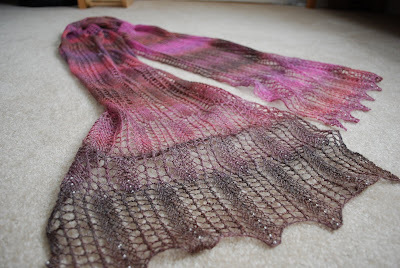 When the spring 2009 issue of Interweave Knits arrived at my door, I saw the Fountain Pen Shawl and knew that it was what this fiber was meant to be. 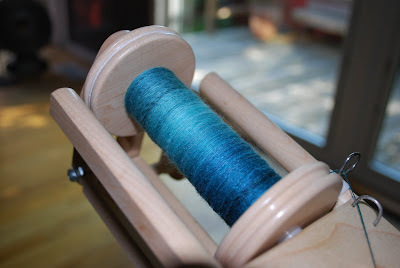 I knew the singles would take a long time, as I was spinning for a two-ply laceweight, but I didn't have any idea that the plying would take as long as it did -- nearly a full week. I joked with The Mister that I had some magical bobbins that never ran out (and, in fact, I did finish plying before they were completely empty because the singles on one kept breaking and I was ready to be done). After about 40 minutes of skeining onto my niddy noddy, I realized just why the whole process had taken so long. I finished with approximately 875 yards of two-ply laceweight. That's plenty for my shawl, and, more importantly, it's a yarn that I feel truly does justice to Kristin's amazing color sense. I can't wait to cast on -- just as soon as my sweater is finished! Hi there! No, I have not fallen on the face of the earth, though the lack of enthusiasm about blogging continues (I think it must have something to do with the fact that I'd much rather be knitting or spinning in the evenings than sit at my computer). However, I have made significant progress on my current projects, so I thought a brief update was warranted. 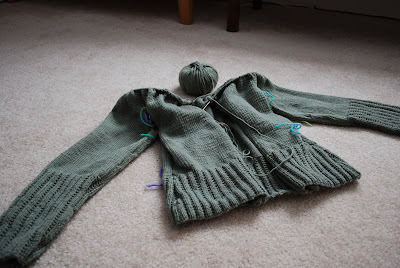 First of all, I'm on to the yoke part of my Tangled Yoke Cardigan. I'm in the very boring knit-back-and-forth portion of it, before a round of decreases and the fun part (i.e., the cabling) begins. And, as usual, I'm already starting to worry about running out of yarn. 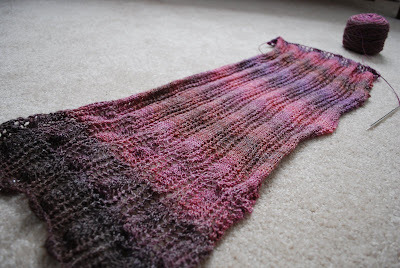 I have, I think, three more complete skeins left after this one. I'm also very close to being finished with my Waves of Grain. 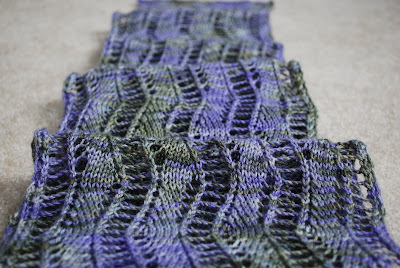 I have about 24 more rows until I'm done with the specified number of repeats on the second half, though I might continue for longer than that both to make the ends match up as closely as possible when grafting and to use up more yarn. 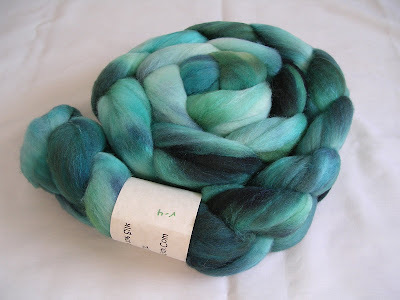 This is the May/June spinalong fiber from All Spun Up. 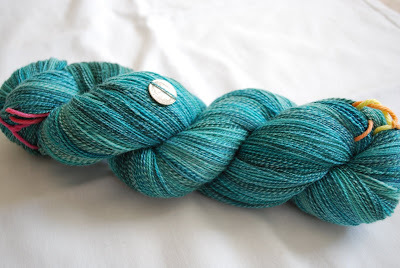 I'd thought about sitting this round out, but I'm so glad I decided not to -- these are so my colors, and the fiber is superwash merino, which is, of course, my favorite fiber for sock yarn. I'll give you one guess what I plan to spin it into. Tomorrow is the third Wednesday of the month, which means I'll be joining the Hurricane Knitters at the Waterworks Barnes & Noble starting at about 7 p.m. Hope to see you there if you're in the neighborhood! I haven't blogged in a few days because I've been steadily knitting along on my current WIPs without much excitement, but I think I've made enough progress to warrant an update with pictures. 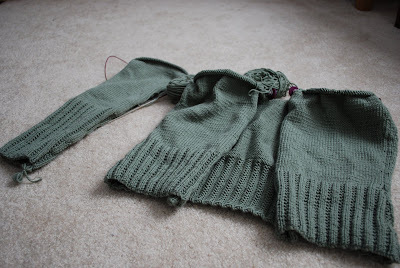 My Tangled Yoke Cardigan is coming along smoothly. I'm nearly finished with the first sleeve, so that should be done tonight and the second sleeve cast on. My lunch break knitting, since finishing the Lace Ribbon Scarf, has been Waves of Grain, knit with my own handspun. I'm just a handful of rows away from completing the first half, so the plan for tonight is to finish that up and cast on for the second half. 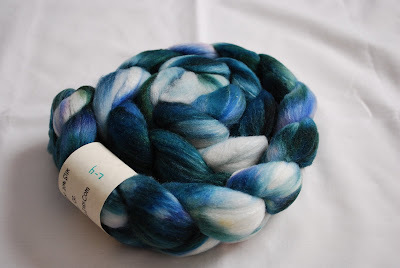 Meanwhile, I've been furiously spinning away on my merino/silk laceweight. I managed to finish off the first bobbin late last week and am probably halfway through the second. 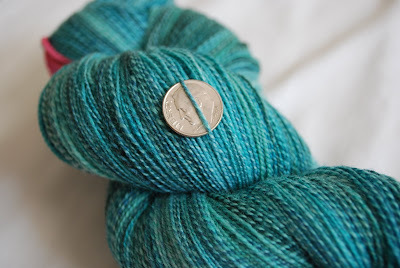 I'm anxious to finish this yarn, not only because I want to see how it turns out but because there's some spinalong fiber on its way to me from my favorite fiber pusher. While I have been working diligently on these projects, I've been feeling a bit of ennui about my knitting in general lately. I'm not sure what it is or what's causing it, but it's been a bit of a cloud hanging over my head and has been keeping me from blogging as often as I like. I feel like there's not too much point in blogging when all I have to say is that I'm still working on a project and all I have to show for it is a progress shot that looks very similar to the last. So I may not be posting until I have something exciting or significant to show for a while, at least until I get my mojo back. In the meantime, if anyone has some good tips on how to chase the knitting blahs away, please feel free to share! Don't you love it when things turn out just right? In this case, I think the yarn had something to do with it. 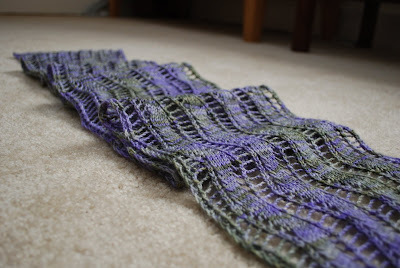 Delightfully drapey, quick to knit, and soft and silky to wear. This scarf is a winner, and with the cooler weather we've been having lately, it looks like I might even get to wear it a few times before the summer weather hits. Bliss is a good word to describe it! ... my projects are growing. 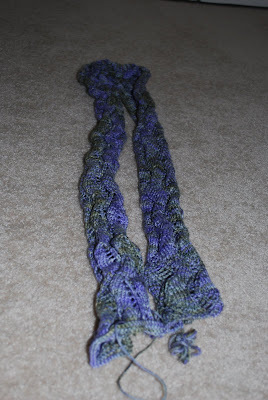 For one, my Lace Ribbon Scarf is done, though not yet blocked. 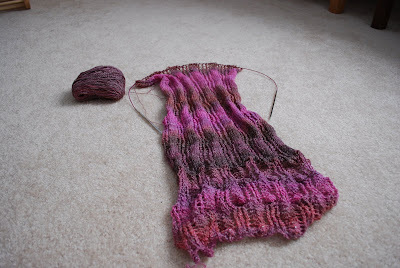 And while my Tangled Yoke Cardigan may look very much the same as the last time you saw it, it has grown. 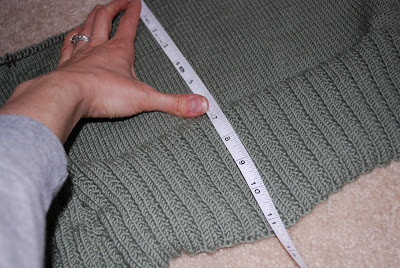 I believe I have two more sets of increases and about two inches left before I put the body on hold and start the sleeves. 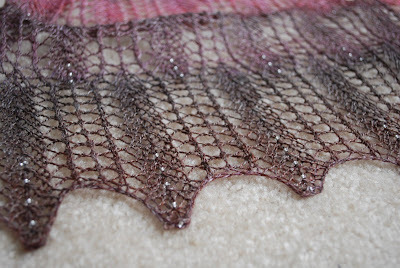 I think I need to start a little bit of lace now that my scarf is done. I have some handspun all wound and ready to go for Waves of Grain. Bring on the beads!